To understand Martin Luther we need to understand something of the world into which he was born in November 1483. The period of history known as the Middle Ages (approximately 700-1300AD) was characterised by hardship, war and little scholarship. Gradually during the 14th century AD Europe started to experience more peace and stability and there was a renewed focus on learning, literature and art, later known as the Renaissance. People started to question and think for themselves. The invention of the printing press in 1440 encouraged the spread of new ideas. Prior to this literacy was limited to the upper classes and the clergy, but now books and pamphlets became more readily available and more people learnt to read. Portions of the Latin Bible were printed and ordinary people were able, for the first time, to read God’s Word for themselves. It’s hard for us to imagine a time when only the clergy had direct access to the Bible, but this is how it was until late in the 15th century AD. 11 November 1483 – Martin Luther was born in Eisleben, Saxony. 1501 – He enrolled to study law at the University of Erfurt. 1505 – The story goes that he was caught in a thunderstorm and in his fear he called out to God and promised to enter a monastery if he survived. 1507 – He was ordained as a priest. 1510 – He was sent to Rome as part of a delegation from the university and was shocked by what he saw there. 1511 – He became professor of theology at the university in Wittenberg. 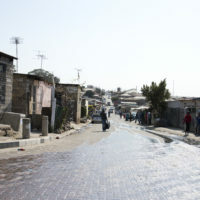 Luther tried for many years to earn salvation by good works – he fasted, prayed and chastised himself, but he continued to be oppressed by a sense of his utter sinfulness. 1512 – He began to study the book of Romans and when he read Romans 1:17 God spoke to him and he realised that people are saved not by works but by faith – the righteous shall live by faith! 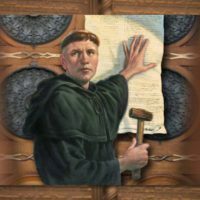 31 October 1517 – Luther nailed 95 theses (propositions for debate concerned with the question of indulgences) to the door of the Castle Church in Wittenburg – in these theses Luther criticised some church practices, especially the sale of Indulgences. This is seen as the start of the Reformation. An indulgence was a payment to the Catholic Church that purchased an exemption from punishment (penance) for some types of sins. Some of those selling indulgences even claimed that the souls of people who had passed away could be freed from purgatory by the purchase of an indulgence. A large portion of the Catholic Church’s revenue came from the sale of indulgences. At this time the church believed that only a priest could administer the sacraments and without the sacraments there was no salvation so the church had a very strong hold on the people. Luther’s ideas would loosen the hold of the priests on the people. July 1518 Luther was summoned to Rome to meet with the Pope – Elector Frederick of Saxony got the summons cancelled. October 1518 – Luther had three interviews with Cardinal Cajetan in Augsburg. A papal bull declared some of Luther’s statements heretical without mentioning his name. A papal bull is a specific kind of public decree, or charter issued by a pope of the Roman Catholic Church. It is named after the leaden seal (bulla) that was traditionally appended to the end in order to authenticate it. He met with Von Miltitz and they seemed to come to an agreement – the pope invited Luther to Rome to make his confession. (Emperor Maximilian died and the pope was involved in the selection of his successor and so left Luther’s fate alone for 18 months). Leipzig debate July 1519. Eck managed to get Luther to say that he did not think Huss was altogether wrong – this meant he was siding with a condemned heretic. From this time reconciliation between Luther and the Roman Catholic church became impossible. 15 June 1520 Pope Leo excommunicated Luther. All his writings were to be burned and he was to be imprisoned. 10 Dec 1520 Luther publicly burnt a copy of the papal bull in Wittenburg. Charles V had been elected emperor – he was a devout Catholic, King of Spain – he summoned Luther to the Diet at Worms in April 1521. The Diet of Worms in 1521 was an imperial diet of the Holy Roman Empire held at the Heylshof Garden in Worms, then an Imperial Free City of the Empire. An imperial diet was a formal deliberative assembly of the whole Empire. Frederick the Wise organised for Luther to be taken secretly to his castle at Wartburg where he remained in safety for about 10 months. During this time he translated the New Testament into German. 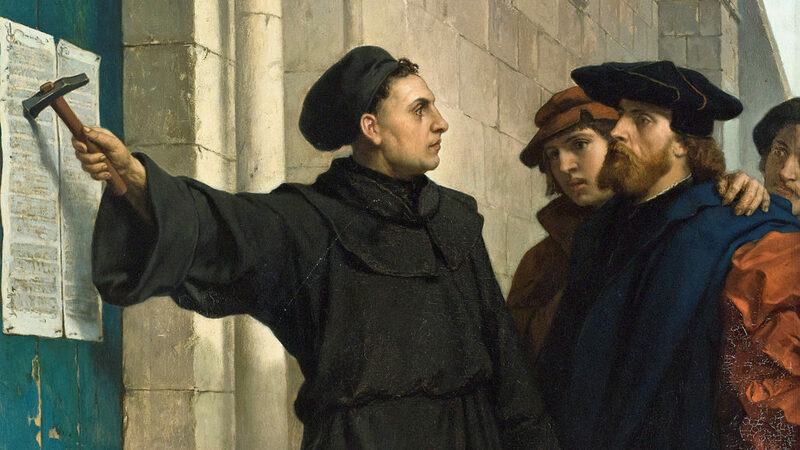 Luther was informed that some of his ‘followers’ were turning to violence and destroying statues, art works, etc in churches in Wittenburg so he returned there to teach them that such behaviour was not in line with Scripture. In 1525 he married former nun, Catherine von Bora. He wrote the official statement of faith of the Lutheran church in what has become known as the Augsburg Confession. He wrote many books and encouraged the establishment of schools everywhere. He completed the translation of the whole Bible into German in 1542. He also wrote songs and hymns – ‘Away in a Manger’ and ‘A Mighty fortress is Our God’ are two of them. He died on 18 February 1546 at the age of 63. Luther did not set out to establish a new church or to break away from the Roman Catholic Church. He would have preferred to reform it from within, but when that was not possible he broke away. Many built on his work and went in diverse directions – Zwingli, Calvin, Anabaptists, Mennonites, Amish, etc. We have the privilege of benefitting from these men of faith and their dedication to serving God according to the Bible.